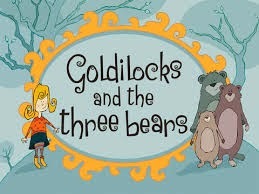 Do you remember the story of Goldilocks and the Three Bears from your childhood? Can you tell the story from memory? Goldilocks tried every pot of porridge. Daddy Bear's was too hot. Momma Bear's was too cold. Baby Bear's was just right! The story goes on but always, always, Goldilocks found something that was just right. The temperatures have been frigid in the South this month. The weather has been way too cold. Cold enough to freeze breathe in mid-air. Summer is headed our way though. The temperatures will get steamy and balmy. Can you feel and see the heat rising in squiggly lines off the pavement now? July and August will be way too hot. The perfect times of year are the few days we relish between Spring & Summer and Summer & Fall. The weather is just right! Goldilocks picked a bed that was just right and went to sleep. She was unprepared for the return of the bears that lived in the house in the woods. We've heard the story that we will be judged by Jesus just as Goldilocks judged the porridge, the chairs and the beds. The difference in these stories are the Bible is not a fairy tale, rather truth. Goldilocks ran away and got a second chance not to wander in the woods. We won't run away from Jesus and we won't have a second chance to accept his salvation and live for him. Hell is too hot. Unforgiven is too cold. Revelation 3:16 states "So then because thou art lukewarm, and neither cold nor hot, I will spue thee out of my mouth." Have you taken your temperature lately? A personal relationship with Jesus is just right!